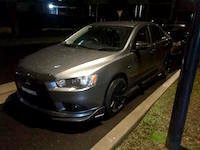 - Fog lights to suit ralliart front bar + wiring loom, interior button and H11 globes. - Custom Catback from Castle Hill Performance. North South facing and will also required cash + swap with your stock exhaust. - XXR 527's in Matte Black (18x8.75 + 35) have 6 odd rims but two of them are pretty scratched up and were replaced by insurance. You get all 6 if you think you want to repair one or use as a full size spare. 5x114.3. Will also include the wheel nuts as well. - If anyone wants to swap interior trim for carbon wrapped trip then let me know. Anything not sold will be sold with the car. are the XXR's multi stud or only 114.3?? Sorry guys, tried to upload individual photos but couldn’t fit the file size requirements. 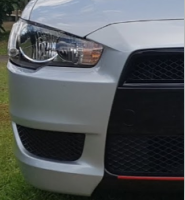 Are you by chance selling your front lip? Also would be interested in the cat back, does anyone know if a sedan exhaust will fit a hatch? Sorry mate forgot to ask about your ralliart intake and k&N, are they an option? Interested in the exhaust, how much + the swap?